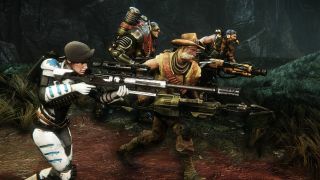 Evolve will soon offer an Observer Mode that will enable a sixth player to join the game, track the action from multiple perspectives, and livestream matches, complete with commentary. The new mode will be added as a free update to the game, on all platforms. Observers will be able to switch seamlessly between the Hunters and the Monster, and rotate the camera 360 degrees in order to view the battle from any angle. Turtle Rock has also created a special HUD for the new mode that can display details like survival odds, perks in use, and a minimap overlay, or that can be switched off completely for a more spectator-friendly view. The addition of the new mode isn't surprising—Evolve is getting its own ESL Go4 tournament series this year, and accessible livestreaming functionality is mandatory if it's going to succeed as an e-sport. Speaking of which, you'll be able to see the Observer Mode in action this Friday during the Evolve ESL Pro-Am tournament, which will be broadcast live from PAX East on Twitch. A release date for Observer Mode hasn't been announced, but Turtle Rock said it's "coming soon."